For the information in this post I am heavily indebted to Michiel Rozema who originally figured this out. 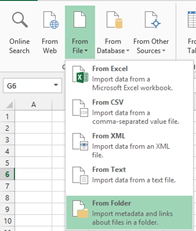 This post is an extension to my previous post on combining text (CSV) files using Power Query for Excel. In this post we will go through the same steps again, but this time for Excel sheets. Combining Excel sheets is a bit harder than text files however. Being able to do this is very handy if you have multiple Excel sheets reporting on different periods, regions or products and you want to combine the data from those sheets into one table to use in your reporting. First we need to make sure that ‘Advanced Query Editing’ is enabled. To do this, open Excel, go to the Power Query tab and choose Options. Then make sure the checkmark for ‘Advanced Query Editing’ is enabled. In order to successfully combine multiple Excel sheets we will need to modify the query’s script. Just like with combining text files using Power Query, get started by clicking ‘From File’ and then ‘From Folder’. Specify the folder where your Excel files are located and choose ‘OK’. Let’s first fix the headers. Right-click on the little table icon in the top left and choose ‘Use First Row As Headers’. What happens is that we define A and then in steps apply functions on A. In each step we take as input the output of the previous step. In the end we return the result of the last function. The M-script above is quite static in the sense that it applies only to the Excel sheet we selected (in this case ‘Sales Data 1.xlsx’). What we need to do is find a way to provide a parameter to this code and execute the code for every Excel sheet in the directory. What we do here is defining a function with two parameters (the path to the files and a filename). Make sure you match the casing of ‘in’ and ‘let’ correctly! Do not use any capitals. Change your M-script accordingly and click ‘Done’. Now, let’s make sure we understand what this query does by changing the name from ‘Query1’ to something like ‘GetExcel’ by double clicking on ‘Query1’ in this screen and entering the new name. We will use this name to invoke the function. Click ‘Done’. We will invoke this function in a just a little while. Now click the icon to select the columns to expand from your Excel sheet and click ‘OK’. Optionally you can rename the columns. When done click ‘Done’ to get the data in Excel. So, if you have set this up and new data needs to be added as long as the structure of your Excel sheets does not change you can just click ‘Refresh’ and it works! This is the amazing power of Power Query.